As the season turns to fall, I am reminded of my experience last year attending a Wiccan festival in McHenry County, Illinois. It was one of the most memorable weekends of my first 52 weeks – as I spent Friday night at a Kol Nidre serviceat a synagogue in town, then spent Saturday at the Mabon festival with members of a Wiccan coven, and Sunday at a Kirtan with a friend. This evening, as I was searching around for interesting worship-related stories, I came upon a site called Daughters of Eve: Pagan Women of Color Speak. I spent some time reading about one of the women on the site, Ebonee Herron-Newson, and her 14 years of practicing as a Wiccan. 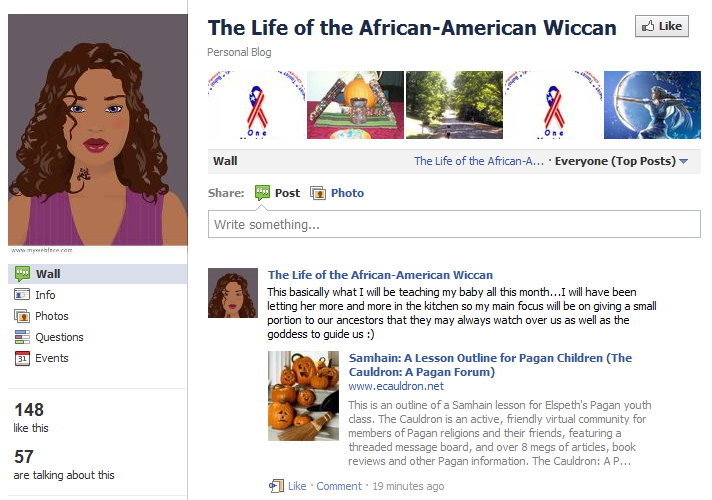 She has a website called The Life of an African American Wiccan, and a related Facebook page. As she notes, in the African American community, Wicca is probably not the most popular or most-chosen worship path. I found her journey interesting, and you may as well.